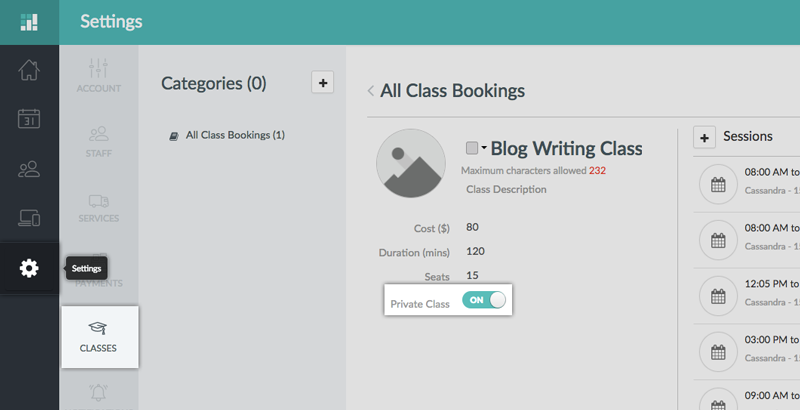 Setmore's class booking feature allows you to create classes and have them be available for customer signups on your Booking Page. Each class can have any number of attendees, and Setmore saves your class data so it's easy to add more class sessions at a later date. You can also track customer payments for their attendance, if you have one of Setmore's payment integrations activated in your account. This feature is perfect if you want to offer classes, group sessions, or trainings for multiple customers at a time. 1. Navigate to Settings > Classes. 2. Click on the “+Add Class” button that appears on the right panel if you are creating classes for the first time. 3. Enter details for Name, Description, Cost, Time, and Seats (maximum number of participants), then click Save. 4. Creating a class will generate a “Sessions” tab on the right side of the viewing pane. Create a class session by clicking the "+Add Session" button. 5. In the session details window, set the class provider and date/time, then click Save Changes. Note that you can create multiple sessions for each class. 6. Creating a session will automatically reflect in your Setmore Calendar. A dark-colored slot in your calendar will appear, and you may click on the slot to open a dialog box that allows you to add attendees to that session. 7. Adding attendees will trigger a set of automated notifications that go out to each customer. To add more customers to the session, you can click the “+Add” option that appears to the right of Attendees. When you create a class session, the class will be available on your customer-facing Booking Page so that customers may sign up for the session. 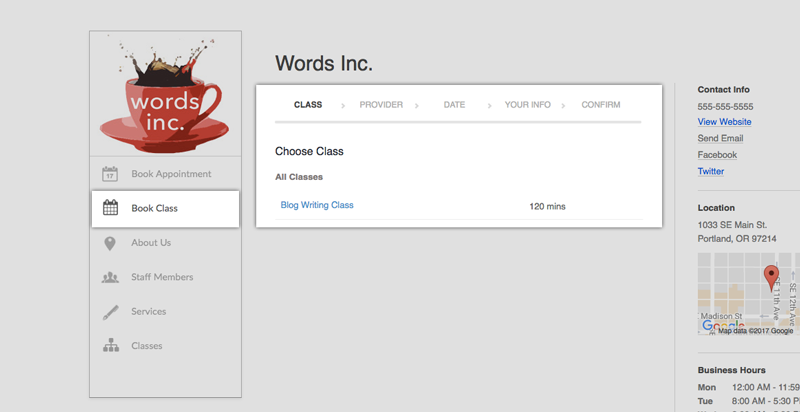 Customers can access the "Book a Class" menu through the left-hand navigation menu. The booking process is virtually identical to how customers would book a regular appointment. If you don't want your class to appear on the booking page, you can mark the class as private. Simply navigate to the class menu under Settings > Classes, then choose the class you would like to make private. In the Class Details menu, find the switch for "Private" and click it into the "On" position.